← Can Canada’s first mental health strategy really find buy-in from the provinces? Part of the mandate of the Local Health Integration Networks has been community engagement. Usually the LHIN organizes the consultation and groups are invited to participate. 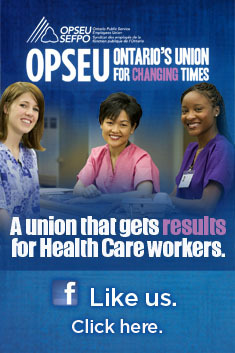 There have been times when OPSEU members have engaged in these consultations and found them to be useful. Other times we have had reports where members felt the consultation process was manipulative towards a specific end. This week we are trying something a little different. Instead of waiting for an invitation, OPSEU’s Mental Health Division is inviting the LHINs to our own consultation. Two regional meetings are taking place this week, although more are being planned. Mental health has been top of mind this week with the release of the Mental Health Commission of Canada’s strategy paper. The Commission tells us that mental health services are improving, but that we need to do more. Of course, administrators of our agencies and psychiatric hospitals would likely agree with that synopsis, but what do the people who deliver care on a day-to-day basis really think? Are services really improving? Do they have sufficient resources to deliver quality care? Who is getting access to that care? Who is not? What happens when clients leave our care, are there other supports available, or is mental health a revolving door? The plan is to ask these kinds of questions and eventually assemble a report to all the LHINs based on the response of our members. Invitations went out to the two LHINs in April. For Friday’s session in Thunder Bay, the North West LHIN is sending two senior staff to participate. We called the South West LHIN this morning after failing to get a response to our invitation. They apologized that they had not told us earlier, but no one would attend this evening’s session in London. Involvement with the LHINs has been controversial among labour. Some have taken the attitude that the LHINs should be disbanded, that they represent no more than another layer of bureaucracy, as Tim Hudak’s Tories say. On the other hand, when we have engaged with the LHINs, we have had some positive results, from keeping open a mental health support agency in Toronto to finding additional funding for community mental health in southwestern Ontario. This year the original legislation that created the LHINs is supposed to come under review. At that time we will have many suggestions on how they can be made more responsive to the communities they serve. The LHINs never lived up to the billing George Smitherman gave them when he served as Minister of Health. However, turning our back on them would be a mistake. Did the South West LHIN miss an opportunity to build bridges with labour? Absolutely. Will it be the last opportunity? Absolutely not. With or without the LHIN, tonight’s meeting will go ahead. Notes will be taken, and a report will be sent back describing the evening’s proceedings. If you are a OPSEU member who works in mental health, please join us tonight at 6:30 pm at the London Regional Office, or at the same time on Friday in Thunder Bay at the Labour Centre, 929 Fort William Rd. If you live in another region of the province, watch for future announcements. If you are in Toronto, don’t forget to participate in “Stop The ‘Crazy,” beginning at 4 pm Saturday at the corner of Queen St. W. and Roncesvalles. This entry was posted in Mental Health and tagged LHIN Consultation, North West LHIN, OPSEU Mental Health Forums, South West LHIN. Bookmark the permalink.